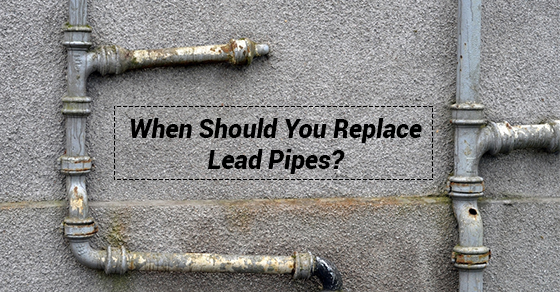 How Often Do You Have To Get A Lead Pipe Replaced? Water supply pipes, naturally, supply water to your home from the water main. Lead pipes are one such type. However, research now supports a number of health risks associated with lead pipes. According to the World Health Organization (WHO), a buildup of lead in the body can damage the nervous system, reproductive system and kidneys. It can lead to other medical conditions such as anemia and affect how calcium and vitamin D is metabolized in the body. These risks are particularly significant to babies and young children as lead has been linked to learning disabilities. If lead in the body is particularly high, people can go into a coma and even die. How Do You Know if You Have Lead Pipes? If your home is older – that is, it was was built before 1970 (and especially before 1950), it is likely that your water supply pipe is a lead one. Lead pipes are dark in colour underneath the colour of paint. While you might be able to guess at whether or not you have lead pipes, the most definitive way to ensure that you have lead pipes is to contact a professional, such as those at Brothers Plumbing. Not only will they be able to identify the type of pipes you have but they will also be able to comment on their current condition – all in the same day. This is a much faster option that contacting the city as record requests can take up to 30 days. Keep in mind that even if the majority of your pipes are made out of copper or other material, it is still possible that your water supply pipe is made out of lead. How Often Do you Have to Get Lead Pipe Replaced? Homes with lead pipes pose serious health risks. If it is determined that you home has lead pipes, it is recommended that you replace your lead pipe to an entirely new material that is modern and thus safer for your health. Copper and PVC are now the main materials used. It will be recommended that you upgrade immediately. In fact, many municipalities also enforce this. If you are a GTA resident, Toronto’s Priority Lead Water Service Replacement Program makes it possible to only have to replace the lead pipes on your own property. That being said, replacing your lead pipes only partially is also possible, so long as your municipality doesn’t have any regulations in place. If you suspect you have lead pipes or are in need of a lead pipe replacement, contact our team of plumbing experts at Brothers Plumbing today. We have over 50 years in the business and a superior track record in the industry. We offer competitive rates, upfront quotes and 7-7-7 service.